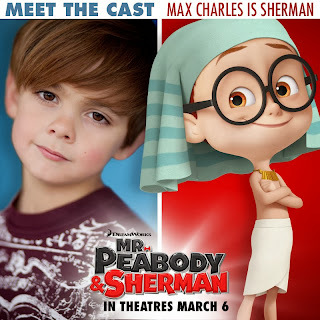 Max Charles, a young actor with an impressive resume at just nine years of age, who played the young Peter Parker in the hit movie "Amazing Spiderman" stars and lends voice to a genius dog's adopted boy named Sherman in DreamWorks' upcoming adventure-packed 3D animation "Mr. Peabody & Sherman." "Mr. Peabody & Sherman" is an adventure-comedy featuring science fiction, time travel, outlandish characters and clever dialogue, all of which are bound together by the unexpected relationship between the titular heroes - a dog and his boy. Peabody possesses the genius of Einstein, the wit of Oscar Wilde, the daring of Indiana Jones, the deductive skills of Sherlock Holmes, the sartorial style of James Bond, and the culinary skills of Mario Batali. The one thing that challenges Peabody is keeping up with his adopted boy Sherman. Peabody devotes himself to Sherman, from whom he learns the one thing even a genius has to figure out - parenthood. Charles' Sherman is open, enthusiastic and over-curious. Growing up with his adoptive dad - the time-traveling super-genius Mr. Peabody - gives Sherman many opportunities for adventure. Like most youngsters, Sherman has a penchant for trouble and sometimes finds himself in over his head, but Sherman always makes certain to fix even the most difficult problems he creates. "Sherman is a genuine kid," says Minkoff. "He's quite naïve at times, but he's actually a terrific student of Mr. Peabody's because one of the special things they do together is travel through history. Peabody has taken the time to introduce Sherman to many of history's greatest events." As any parent knows, there are children's "leaps" that can lead to breakage - and for Sherman, breaking the rules of time travel has extraordinary consequences. Says Max Charles: Sherman is "a normal kid who gets to do some unusual stuff, like travel back in time." Sherman learns a lot about everything from Mr. Peabody, and as Charles sees it the reverse is also true. "Peabody also learns a lot from Sherman, like how to be a little more laid back, and a little more trusting." As for Sherman's animation design, Schleifer and his team ensured that he feels and looks like a child. "I looked at my own kids to see how they respond to certain situations, and I discovered interesting kid-like things to make Sherman feel authentic and support the story of his adventures and transformation." A key challenge was dealing was animating Sherman's oversized - Schleifer calls it "ginormous" - head, which adds to the character's appeal and fun. "The head is so big and it's attached to a tiny neck, so we had to incorporate Sherman's entire body into even a simple head turn," he explains. "Or it would look like it would just snap off!" Prominent eyeglasses are a key feature shared by father and son. The animators had to carefully maneuver the specs and the characters' eyebrows to ensure that Peabody and Sherman were able to convey the necessary expressions and emotions. "The glasses cover their eyebrows, so if we did nothing you'd never see their expressions change," says Schleifer. "So when Peabody and Sherman convey excitement, we had their eyebrows go way upon the tops of their heads. And when things get intense, the brows drop straight down and cover their eyes." "Peabody realizes that Sherman's imperfections are what make him so wonderful," adds Ty Burrell who voices Mr. Peabody, "and that it's really worth trying to make himself more vulnerable." Director Rob Minkoff adds: "Max performs with emotion, depth, heart and humor. That's not easy to find in a young actor." A DreamWorks presentation, "Mr. Peabody & Sherman" (available in 3D and 2D) is a DreamWorks Animation SKG presentation and a PDI/DreamWorks production, opens March 6 in Philippine cinemas nationwide from 20th Century Fox to be distributed by Warner Bros. Check out the film's localized site here for more updates, videos, mobile apps and lots of games and downloadable fun stuff.